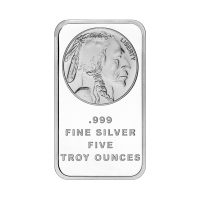 5 oz Silvertowne Buffalo Silver Bar | ?? 正面 Indian head, with the word "liberty" Followed by the bars purity, and weigh. 反面 A Buffalo with the words "United States of America" and the latin phrase "E Pluribus Unum" overtop a waffle pattern background.